As the years go by, and more and more mac and cheese is consumed, many people find themselves struggling with a few extra pounds. I am one of those people. To wit, these past few weeks I have been looking for healthier recipes and thought – is it possible to make a decent lowfat version of mac and cheese? As we, the lovers of the mac and this blog, know, our favorite pasta dish is anything but light on the fat and calories. 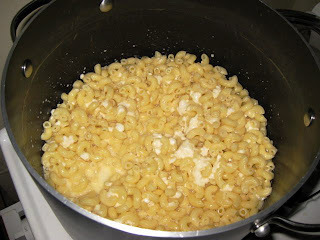 So a quick Google search for “healthy mac and cheese” brought me to a column entitled Recipe Rehab with Tanya Zuckerbrot http://www.thatsfit.com/2009/08/06/macaroni-and-cheese/. The recipe is similar to the NY Times Mac and Cheese recently prepared by our own Ms. Suzy Gruyere, in that it relies on cottage cheese. 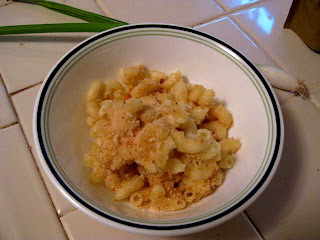 A shockingly simple recipe, this Rehabbed Mac & Cheese requires only 7 ingredients – pasta (multigrain), Cheddar cheese (lowfat), the aforementioned cottage cheese (also lowfat), milk (lowfat, natch) salt, pepper and breadcrumbs. Full disclosure here – as much as I want to lose those few pounds I mentioned before, lowfat cheese is an abomination to me so I used regular extra sharp Cheddar. And since I know that multigrain pasta and regular pasta have about the same calories – I figured, who will judge me if I use regular elbow noodles? OK so with those things out of the way, we shall proceed. As I prepared the recipe, I immediately questioned the proportions – 1 cup each of milk, cottage cheese and cheddar for 1 lb of noodles? I could not compute how that small amount of liquid would cover that much pasta, but I went ahead as written, heating the milk to a boil and then adding the cottage cheese, Cheddar, salt and pepper and stirring until melted. I had about half a container of cottage cheese left over and, realizing I have never eaten cottage cheese by itself and wasn’t going to start now, I ended up throwing in the rest (making it 16 oz instead of 8) and another cup or so of Cheddar. The resulting sauce looked smooth and creamy until I poured it over the cooked elbow noodles – then a frightening congealing effect took place, which troubled me (as did the fact that nearly all the sauce immediately disappeared). Undaunted, I threw on some breadcrumbs (with a little Pecorino Romano mixed in for good measure), popped the strange concoction in the oven and prayed that some miracle of science would take place and a creamy, cheesy, bubbly casserole would emerge from the oven. Twenty five minutes later, my worst fears were realized – this was one dry and flavorless dish. 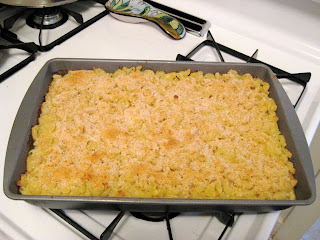 As opposed to being Mac and Cheese – it was more like Mac and Breadcrumbs, with an essence of cheese. It does in fact taste like food you’d eat on a diet, but I’d rather splurge on a richer version and eat less of it, than scarf down an entire portion of this subpar diet version. So I know what you’re thinking – how can The Humboldt Fog review this recipe with any impunity after making multiple changes to it? I agree, my review does not accurately reflect the recipe as written, but I defy anyone to produce a better result. This recipe suffers from a standard diet mantra – portion control. The way this mac has become lowfat is by reducing not only the fat content of the culprit ingredients, but the quantity as well. A quick review of the recipes so far reviewed on this blog show that most if not all have a higher wet to dry ingredient ratio than this recipe does. If I were to redo this, I would cut the pasta in half and see what happens – if anyone out there tries it, as written or with modifications, let us know the results! I love that your blog is all about mac and cheese! Such good comfort food!